In case you didn't already know, let me tell you about what I believe is a pretty unusual trip to work. My new farm is located about 30 miles from where I live in Forest Park. In great traffic it's about 45 minutes. In horrible--aka: typical-- Chicago traffic it can be anywhere from 1.5 to 2.5 hours... one way. Further complicating things is the fact that I don't drive (have poor eyesight; would run into things and kill ppl etc). So the way its been working is my wonderfully supportive husband has been volunteering to drive me to the farm before he then drives all the way back downtown to go to his job. Initially we thought him driving me would be the plan every day, but it quickly became clear that was a no go, unless Hubs just happened to enjoy driving 6 hours a day and I enjoyed being stuck at the farm 14 hours at a time (no exaggeration). 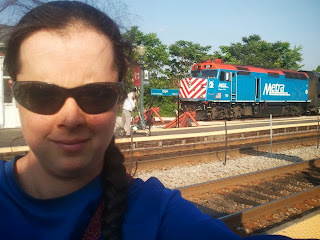 So plan B: I take Metra, Chicago's commuter rail, to and / or from the farm regularly. Oh, what's that, you have questions?? --Isn't that expensive? Well yes and no. Its $5.75 one way plus $2.25 for transferring the bus that gets me from the train to my house in the instances that Hubs can't pick me up at the train. But its still cheaper than what we calculated we spend on gas for Hubs to drive me to the farm. 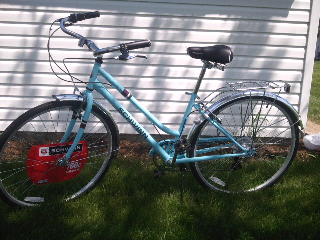 I got some new wheels to get me to and from, although lately ive beeen getting car rides from some farm friends. (the Trike is staying in FP so I can use it to get to my other job and also would take up too much space in the shed at the farm). --How often do the trains run for a trip headed AWAY from downtown in the morning and TOWARDS downtown in the evening? About once an hour, which generally is kinda not so good but in practice has turned out to work ok. As long as I plan my day it works out. --Doesn't it take you even longer to get there on the bus/train/bike relay? Well, no. That's how bad Chicago traffic is! --Don't you stick out on the train? The dirty farmer on a train full of people commuting to the office? Well, no... at least not too bad anyway! The trains going away from downtown seem to have fewer office workers and more laborer type workers, which I guess I am now too! I actually really dig it; wearing my dirty boots and carrying my gallon jug of gatoraid on the train. Also yesterday I rode the train carrying a box of kale and other greens. I had a few people comment on that. Apparently carrying veggies around the train could be a new form of marketing I never considered before! --I thought you were going to move to Elgin, what happened with that? We decided we like living in FP and we didn't want to go through the immense hassle of moving so I'l continue to be a commuting farmer for now.. and I'm ok with that. --Wouldn't you rather live on your farm? Well, in some ways yes. Obviously it would make my commute MUCH shorter and mean I'm near the farm so I can keep an eye on things and know for sure when it rains on the farm and stuff. But, I also have a great appreciation for living in the (almost) city where I can take the CTA train into Chicago for an evening concert or can walk just a couple blocks from my house to dozens of shops and restaurants. This battle of rural vs. urban has been raging a lot in my head, and in my household, for a while now. For the moment I think we've found a nice compromise. --What about having an urban ag site in Chicago? That would certainly take care of the transportation and city vs. rural problem. But, my experience tells me that a) there aren't a lot of acre plots just sitting around in Chicago that are easy to access (ie: buy for cheap, have donated, or rent for a decent price). Also, most vacant land in the City is located in neighborhoods that have some level of crime problem. I don't want to be afraid to go to the farm or feel that I'm putting myself in danger or put my farm at risk of being vandalized. If someone out there came to me with a plot that was affordable for me to use in an area I felt at least somewhat comfortable being in, then I'd definitely consider it. I love urban ag as a concept and it would certainly help to de-complicate my life in some ways. So that's my story. I doubt I'm the only farm worker who commutes a long way to get to their job. As a matter of fact I know a guy who lives in the south suburbs and commutes to the Dekalb area to work on a farm. But, I don't know many farmers who take the train to work. I kinda like being the weird dirty stinky girl carrying veggies on the train.